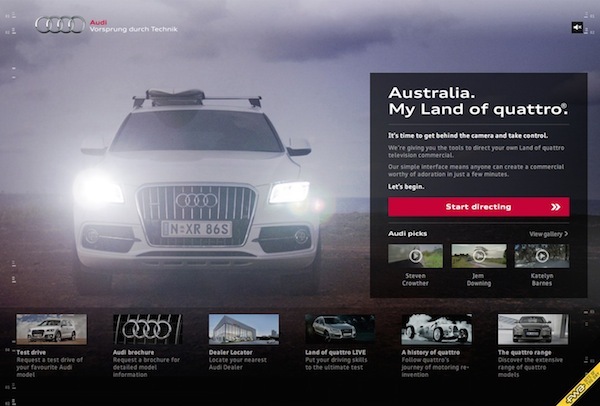 In this marketing case study, learn how Audi Australia’s ‘Land of Quattro’ campaign increased test drives by 28% and was the first campaign by the luxury automotive brand to be made in Australia. 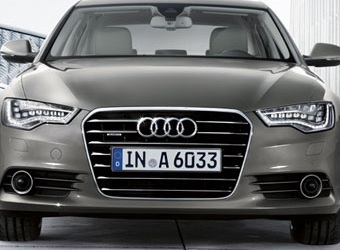 Audi is a global brand recognised for its progressiveness in technology and premium, high-quality product. With progressive technology firsts throughout its history and an inherent drive for perfection, the Audi brand is a high-end premium automotive brand the world over. In Australia, the Audi brand is still relatively young compared to its key competitors, and with increasing numbers of market entrants from brands and diversification from manufacturers into the premium category, it was imperative to give some meaning to the Audi brand for Australians. Audi’s all-wheel-drive Quattro technology not only embodies the brand’s progressive philosophy, but also provides a market leading technology for performance, control and safety. ultimately drive enquiries to Audi Quattro models. The challenge was to deliver a mass market brand campaign into market with a KPI to increase test-drive enquiries for this unique car technology. The primary target market was recognised as ‘urban adventurists’ – high achieving individuals, chasing fresh experiences, with active lifestyles and a passion for new technology. These characteristics most closely aligned with the core brand pillars of progressiveness and Quattro. 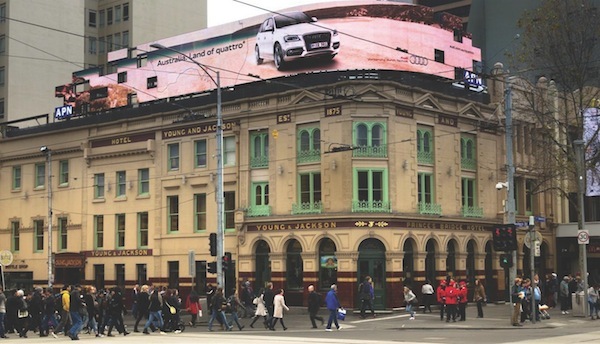 With high conversion of Quattro sales from test drives, the campaign set out to enrich the consumer brand and product experience in a highly accessible meaningful way. Australians had to be allowed to help shape the campaign in their own way, with their own story. To be unique and compelling, and reflect the brand attributes of progressiveness, the delivery for mass awareness media was achieved by reinventing the traditional TVC production approach. The ‘hero’ Audi Q5 was captured from multiple angles using state-of-the-art aerial tracking technology and car-mounted GoPro cameras. ‘Australia. Land of Quattro’ ran over a two- month period with a significant investment at a national level and local support from the Audi Dealer Network. 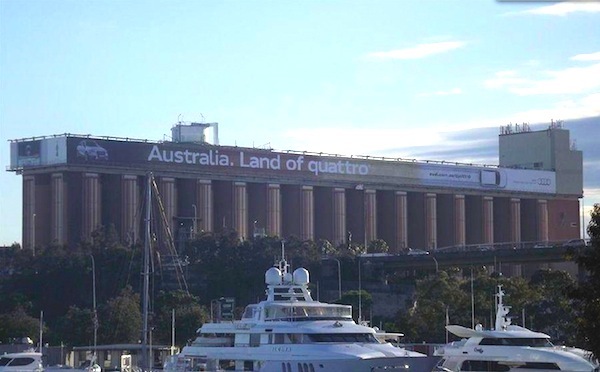 Visiting a custom-built ‘Land of Quattro’ m-site, consumers were invited to design and direct their own TVC using the footage shot across Australia. With around 1.2 billion possible combinations, no two TVCs would be the same. The submitted TVCs would be judged by a selection of Audi brand ambassadors that included Naomi Watts and actor/director Richard Roxburgh. The winning TVC was aired on national prime time television with the winner’s name credited as the director. The campaign used high-impact media placements selected in every state, reflecting the locale through images chosen. Map pinpoints featured within the creative were also localised to the state and media placement. Interactive online takeovers, social media activity and a National Geographic Channel sponsorship around a high-profile Australian six-part series Life on the Edge supported achieving the awareness needed to communicate the interactive online brand experience, which in itself would be aired through broadcast media. Extending the relevancy thinking beyond the traditional ‘delivery to market’ approach, an end-to-end tracking report was designed, providing a holistic view of channel activity and conversion, capturing all trackable media sources, visitor demographics and digital context. 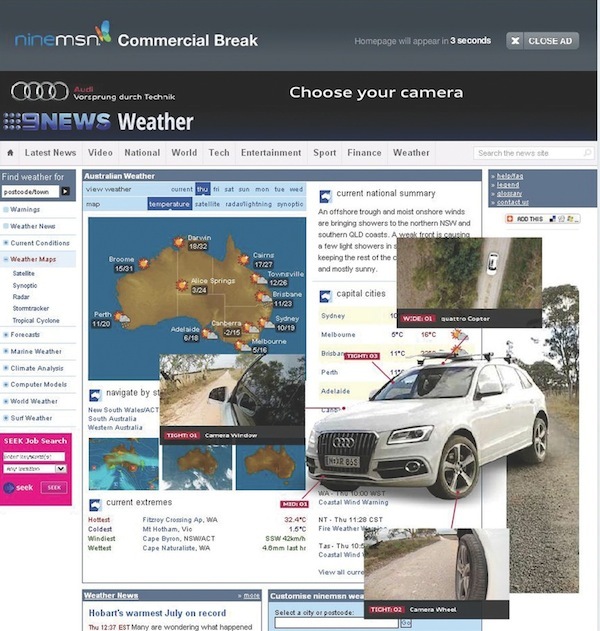 Audi Australia was thus enabled to optimise the campaign on a weekly basis, with a very short optimisation cycle, ensuring the consumer brand experience remained relevant and provision of informed media and site performance remained throughout the campaign life. test drives throughout the campaign period increased by 28%.